Toyota unveiled a Corolla surprise this week. The all-new 2019 Corolla Hatchback does not come from any prior vehicle. It is not a restyled version of the current Corolla sedan, nor it is a restyled Corolla iM (previously Scion iM). Rather this vehicle is on a new platform never before used by any U.S.-spec Corolla and will use an engine never before used in any Toyota car in North America. The Corolla Hatchback will use a new 2.0-liter engine of extremely high efficiency. It seems to be the same engine that Lexus is planning to us in the new UX crossover. Although no horsepower or performance specifications were provided, we expect a significant bump in both quickness and driving enjoyment. In other words, this Corolla could be fun! The new Corolla has other firsts. This is the first we have heard of a Toyota Corolla offering both Apple Car Play and Alexa integration, and it is now standard. The majority of smartphone users who opt for an Android device will have to wait a bit longer from what we can tell. 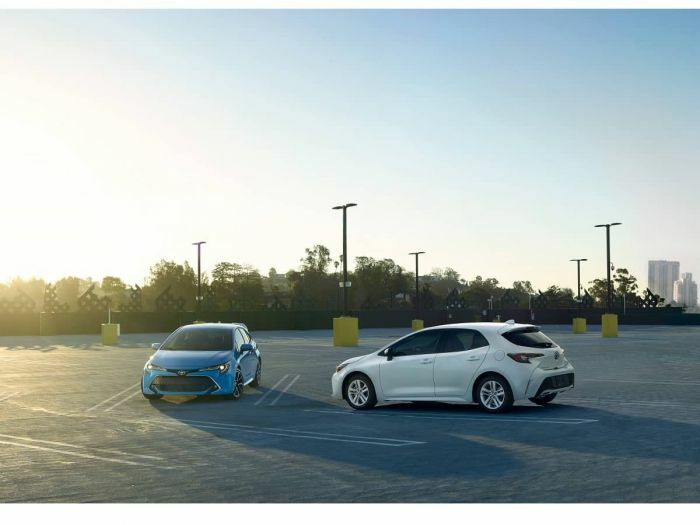 The new Corolla Hatchback will also be the first North American car to have Toyota's new Safety Sense 2.0 active safety suite. This includes pedestrian detection, autobraking. Full speed dynamic adaptive cruise control is standard on the automatic. It is not possible to use such a system with a manual. Toyota will also now have steering assist for lane keeping. Similar to Pro Pilot by Nissan and Sensing by Honda. The new Corolla Hatchback will go on sale this summer. We will bring more details and driving impressions following a test of the new Corolla Hatchback. Toyota really "copied" Mazda on this one. It looks just like the Mazda3 Hatch from a few years ago.